Now’s the part where you tell me I’m not the only one who re-grows scallions AND watches Catfish. Onto the food. I know at some point you’ve had leftover quinoa and brown rice in the fridge. It’s time to marry the two, and make this seriously addictive fried rice and quinoa with tofu and…. scallions. Of course you saw that coming. I kind of had a revelation the other day about searing off the tofu in two big pieces, then slicing it up. It’s worlds easier than trying to flip 24 individual tofu cubes while avoiding spitting oil. Easy, delicious, and minimal second degree burns. Mission accomplished. -Fully aware that quinoa is a seed not a grain. Don’t call the crop-police when I refer to the rice and quinoa mixture as ‘grains’. -After serving up a bowl of this, I like to drizzle it with this Sweet Thai Chili Sauce. 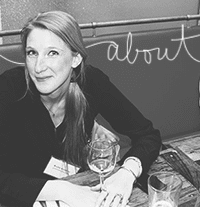 Which would taste good on a shoe, so of course it tastes divine on fried rice and quinoa. Stand the tofu block on one of its thinner ends and slice the block lengthwise, so you have two thinner rectangles. Remove as much water from the tofu as possible by placing both pieces side-by-side on a stack of paper towels. Top with another stack of paper towels, and place a heavy skillet on top of the paper towels. 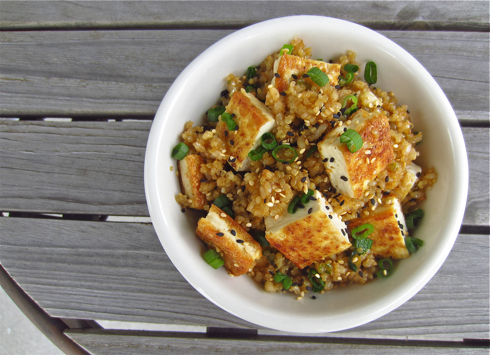 While the tofu is draining, add the rice and quinoa to a large bowl. Use a rubber spatula to combine the two grains. Add 2 tsp of canola or vegetable oil, the soy sauce, and the vinegar, and toss to combine. Set aside. Heat a large, nonstick skillet over medium-high heat. Add about 2 tsp canola or vegetable oil. Once oil is hot, place both drained tofu pieces in the pan. Cook for 5-6 minutes, until underside is golden and has formed a crust. Flip each piece, and cook for another 5-6 minutes. Move tofu to a paper towel-lined plate to drain. Reduce the heat to medium-low. Add another splash of oil if the pan looks dry. Then, add white and light green parts of the scallion, and the ginger. Season with a dash of salt and pepper. Cook for 3 minutes, then add the minced garlic. Cook for another 2-3 minutes until the garlic is fragrant, but not brown. Transfer all of the sautéed aromatics to the bowl of rice and quinoa, and toss to combine. Increase the heat on the same pan to medium-high. 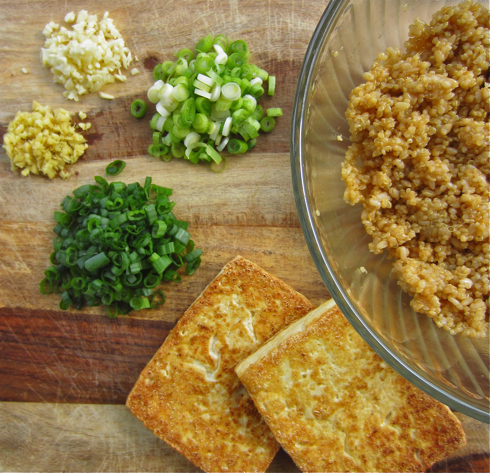 Pour all of the quinoa-rice mixture into the pan, and use the spatula to spread it out in an even layer. Cook for about 1 minute, until the grains on the bottom become toasty and nutty smelling. Use the spatula to stir and redistribute the grains, then spread them out into another even layer. Repeat this process 5-6 times until the majority of the grains are toasted. 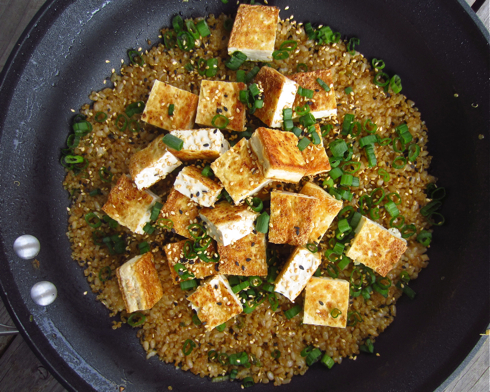 Using a serrated knife, slice the tofu into cubes. 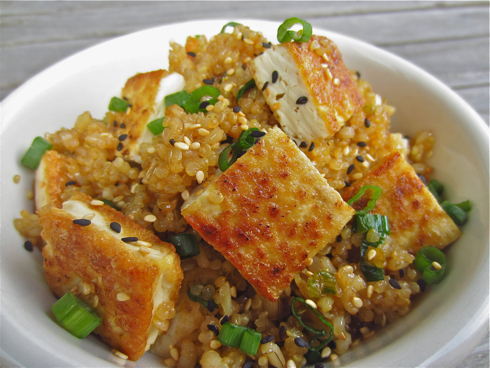 To the fried rice and quinoa, add the tofu, dark green parts of the scallions, sesame oil, and sesame seeds. Toss to combine everything in the pan, and cook for another few minutes until the tofu is heated through. Made this twice now! First time I added snow peas for extra crunch and made it with organic chicken (cooked in fry pan, ~8mins each side w lid on). Tonight we added toasted pumpkin seeds, no sesame, and it was so great! You're the best, GFB!